A beautiful Mother’s ring is a thoughtful gift that Mom or Grandma will appreciate any time of year – and now you can give her one even if your budget is a bit tight! These affordable mothers rings feature her children’s birthstones and/or names, and are all priced at under $50 (shipping not included). Note: Many of the rings from Limoges Jewelry will show up as over $50. However, they ALWAYS have a coupon at the top of the page. The prices should be under $50 when you add the coupon. Thrill a special lady (or yourself) with a personalized ring that shines brightly with 3 heart-shaped birthstones. The child’s name is engraved next to the ring, while the inside is engraved with the word, “Family”. Arrives ready for gift-giving in a beautiful presentation box! Exquisite ring shines brightly with 4 marquis-cut Swarovski birthstones, highlighted by a name on the side. Unique ring comes in your choice of sterling silver, gold plated silver, or hard-to-find rose gold. 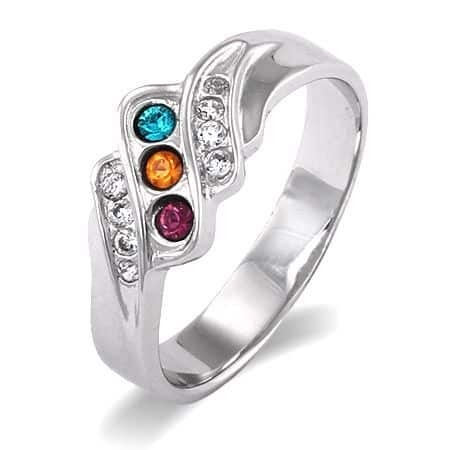 Sparkling infinity ring shines brightly with 3 birthstones. It’s accented with shimmering crystal clear cubic zirconia stones for extra glimmer. A look that Mom or Grandma will be proud to wear! 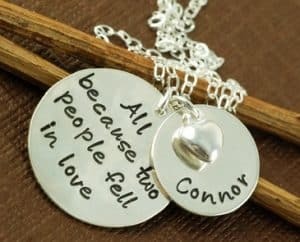 A wearable keepsake honoring the special people in your life. 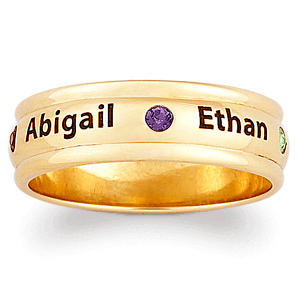 This traditional family band features a warm 14K Gold plated finish and is inscribed with your family names and inlaid Austrian crystal birthstones. Celebrate the special bond you share with your mom with this sweet double band ring. Mom will love the sentiment behind this ring as much as she loves the stylish look! 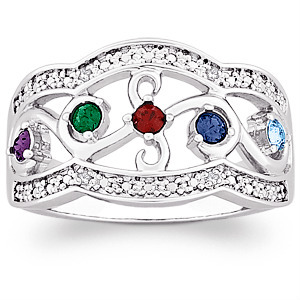 Highlight Mom and Dad’s birthstones in this delightful infinity ring. 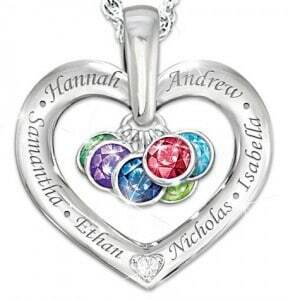 Place the parent’s birthstones on the outer two stones, then add 3-5 gemstones in the center to represent the kids. Delicate ring is a stylish and sweet way for Mom or Grandma to show their pride and love in their family. Add up to 7 birthstones to represent loved ones. 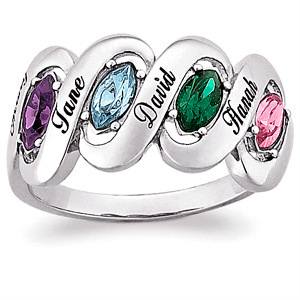 Delight Mom or Grandma with a ring she can personalize with the birthstones of her loved ones. Faceted Austrian crystals are placed into a glowing silvertone, filigree setting. 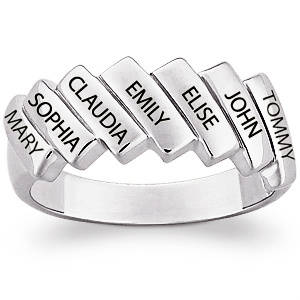 Remind Mom of how much you love her with this striking personalized ring! 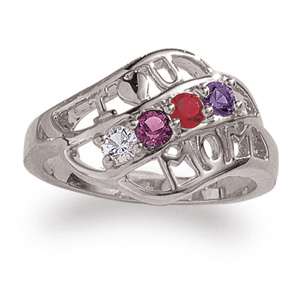 The “O” in Mom is accented with her own heart-shaped birthstone. Mom will love all the compliments she gets when she wears this unique ring! 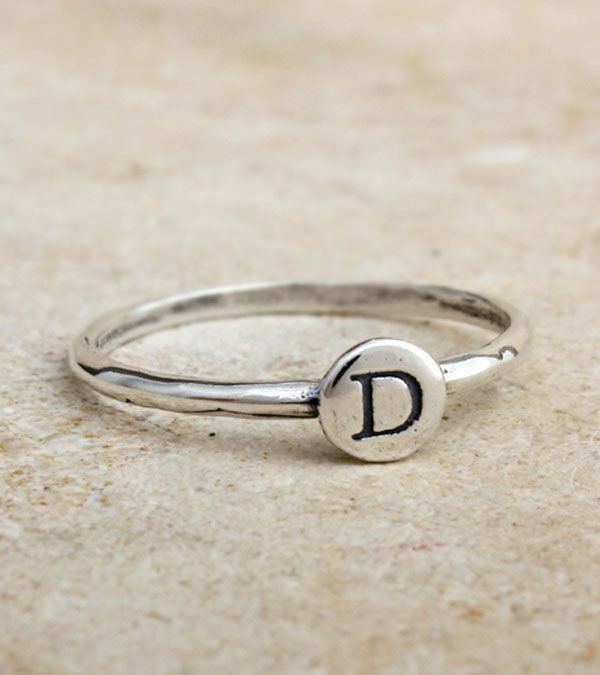 Trendy ring is the perfect choice for the Mom or Grandma who prefers a simple, hand-stamped look to her jewelry. The no-tarnish stainless steel band is engraved with up to 3 names, each separated by a heart. This mother’s band was made to be noticed! 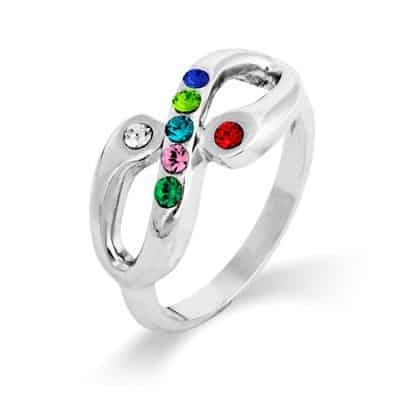 Shimmering ring features up to 5 children’s names and birthstones. If your family is larger, order an additional ring, as these are perfect for stacking! Mom or Grandma will always be reminded of those she loves when she wears this affordable Swarovski crystal birthstone ring. Add up to 5 loved one’s birthstones. You can add a name or personalized message to the inside (extra fee applies). ​Mix and match! Stack and spell! Say whatever you want with these great stackable Alpha Dot Rings. Spell a child’s name, stack your initials or get one initial for each of your children/grandchildren. Lovely ring for Mom or Grandma at a price that won’t break your budget! 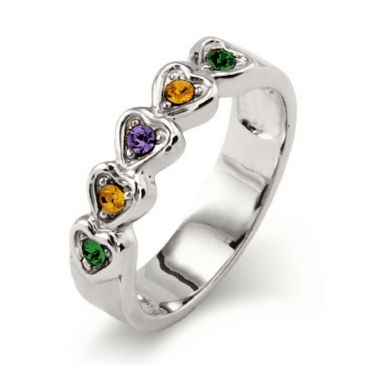 Features up to 6 family members birthstones joined by hearts to create a circle of love. This chevron-inspired personalized family ring is a modern interpretation of the classic mother’s ring. Polished bars of Sterling Silver are engraved with the names of loved ones. A contemporary ring for the trendy Mom or Grandma! Stylish stackable rings are all the rage in women’s jewelry right now. 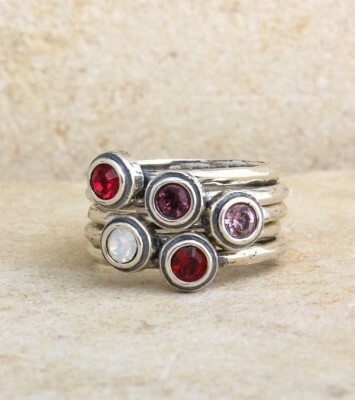 Mix and match these delightful birthstone rings with existing jewelry or with each other to create your own look. 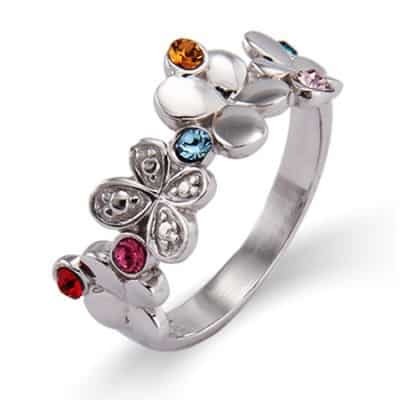 Bring a touch of spring to your mom’s wardrobe with this cheerful fluttering butterflies family ring! 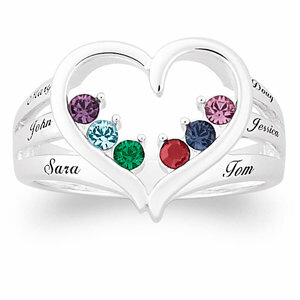 Personalize by adding up to 5 birthstones of your choice. An affordable Mothers ring that’s sure to delight! Add up to 7 birthstones to create a special gift just for Mother. Polished open heart is set with the birthstones of loved ones. Silvertone bars are engraved with their names. A great gift idea for Mom or Grandma that won’t break your budget. This ring can take up to 4 weeks to ship out, so order early! The fabric of a family is woven of the strongest ribbon. Wrap your favorite mom or grandmother with the names and birthstones of her loved ones amongst polished ribbons in a silvertone setting. 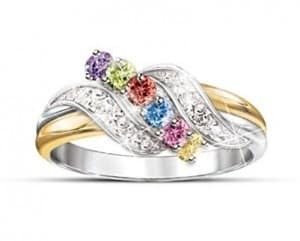 Dazzling ring shines brightly with 3 Austrian crystal birthstones. The row of birthstones is surrounded on either side by another row of sparkling clear crystals to create a stunning look that Mom is sure to love! Darling heart shaped affordable mothers ring is a great gift idea for Mom or Grandma for any special occasion. 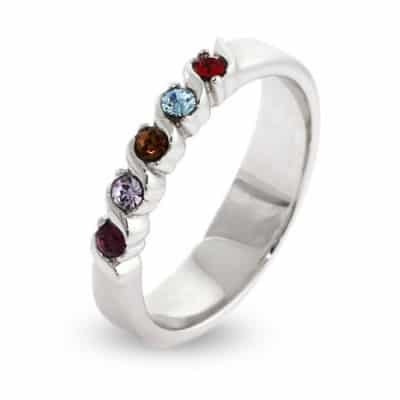 Add up to 7 crystal birthstones to represent all of her loved ones. 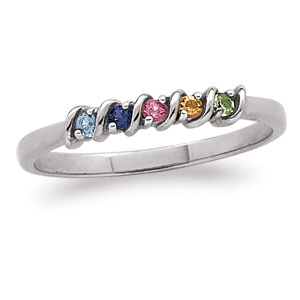 Celebrate motherhood with our reasonably-priced Mom’s birthstone ring. Choose up to 7 Austrian Crystal stones handset amid a loving message plated in brightly polished Rhodium. The perfect way for Mom to display her love for her family! Up to 14 birthstones can be added to this unique “I LOVE YOU” ring setting. Comes with a FREE pair of pearl earrings – two gifts for the price of one! A celebration of family bonds is captured in a bold design. 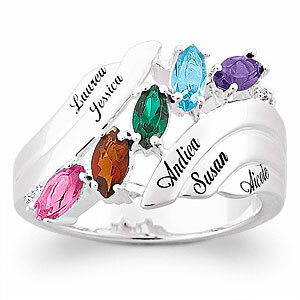 Striking ring features up to 5 family member’s names and birthstones.